It's easy to collect too many magnets. Businesses give them away and happy couples use them as Save-the-Dates for their big day. While it may seem like the trash is your only option, there are a number of ways to rid yourself of unwanted magnets cluttering your fridge. Choose the best method for your needs. Too many magnets can clutter a fridge. 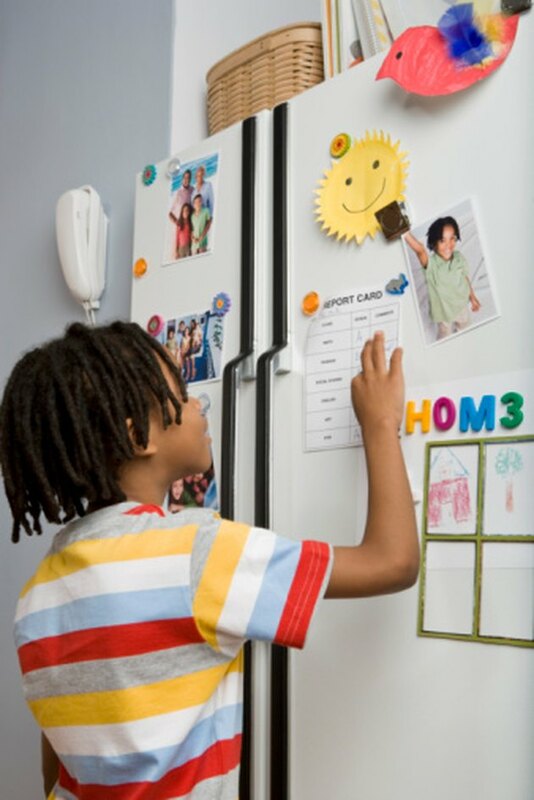 Refrigerator magnets are not commercially recyclable, which means that you can dispose of the magnets along with your household trash. However small, magnets do take up landfill space. Before you dispose of them in the garbage, make sure that it's your best option. Those rectangular magnets businesses give out have alternative uses that may fit your needs. In an office, tape a magnet to your office or cubicle wall, then stick paper clips to it so they're ready when you need them. If you sew or craft, keep a magnet in your craft box. Needles, pins and other metal craft items can be collected and cleaned up with the help of your magnet. With a little ingenuity and some pictures, you can transform those unwanted magnets into cute new magnets for you or your loved ones. Simple cut out an image and glue it over the old magnet to turn that boring ad into a photo of your child, pet or partner. Once you customize magnets, give them away as gifts. You can even cover the magnets with text to create your own magnetic poetry. Magnets that are in good shape might be of better use to someone else. Alphabet magnets could go to a nearby preschool, day care or could be handed down to a relative or neighbor with kids. If you can't think of anyone who wants or needs magnets, donate them to a thrift store to get them out of your life without putting them in a landfill.